Derry City players pictured in training at the Ryan McBride Brandywell Stadium on Thursday. DERRY CITY’S new signing Junior Ogedi-Uzokwe says he’s had to quickly adjust to the intensity and physicality of the Brandywell club’s training sessions. The 24 year-old Londoner finalised his sixth month loan deal from Colchester United on Wednesday and is excited about getting his League of Ireland career up and running. He’s already bagged two goals in the 8-0 thrashing of Ballinamallard at Ferney Park on Tuesday but admits the rough and tumble of Derry’s full-blooded training sessions has taken him by surprise. The striker has embraced the challenge, however, and is already loving life in the city. “I expect the league to be physical and I expect tackles to come flying in earlier because, even in training, you see tackles flying in and it’s different,” he smiled. League Two Colchester attract an average home gate of around 4,000 while his former club, Bromley play in front of 2,000, so Ogedi-Uzokwe is excited about the prospect of playing at a packed Brandywell Stadium. Derry City's new signing, Junior Ogedi-Uzokwe. “It’s similar levels in terms of crowds so I’m looking forward to seeing it packed. I’m excited to be here. It’s all new and an opportunity to get some games and score some goals and hopefully I can do that." 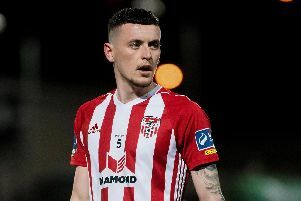 He's enjoyed pre-season training with the Candy Stripes so far and believes the way Declan Devine and his coaching team play the game will suit his style. "I love coming deep for the ball, spinning in behind and I really like the way we play," he said. " We play the game the right way so I'm really enjoying it. "The training camp in the Isle of Man was so cold but the style of football was very good. I don't remember having to jump for header so I enjoyed passing it about which was nice. "I spoke to the manager and Paddy (McCourt) and they told me all about it and what they're plans are. I thought it was exciting. Obviously I'm just looking to help the team, win the first game of the season and take it from there. "I'm on loan but I'm here to score goals and help us win games and see what happens."